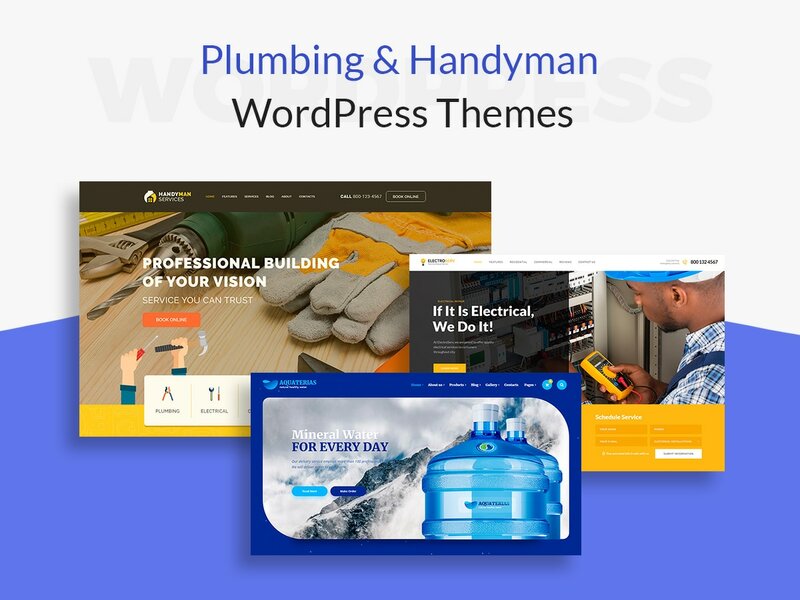 Here we are with another cool WordPress themes collection including the readymade designs devoted to plumbing, carpentry, plumbing, repair, electrician, paving, painting, renovation, cleaning, and other related home services. 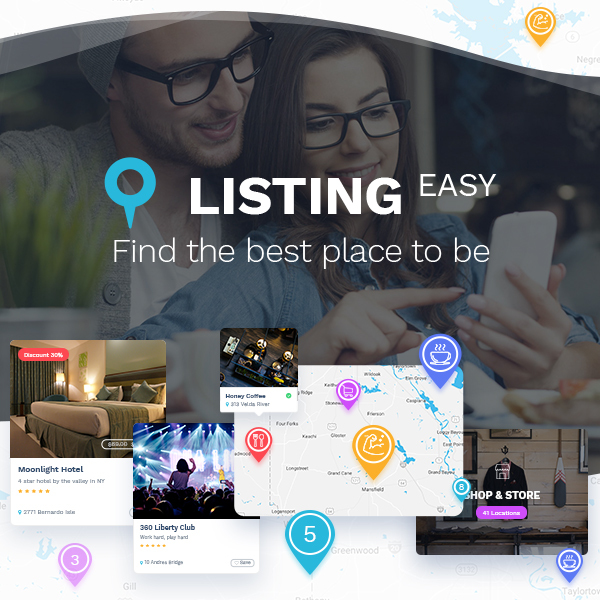 This showcase includes only the freshest and the best templates available with tremendous amount of features making it extremely simple to create your online presence without any specific skills and expenses. Enjoy! 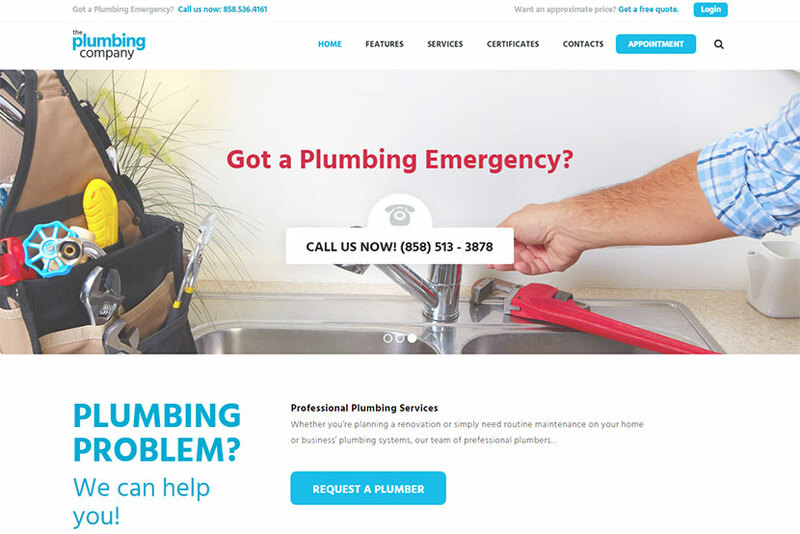 A cool WordPress theme designed for plumbing companies, plumbers and home repair services providers. It comes with all necessary page layouts including testimonials, about, project details, blog, etc. So you can present your services as extensively as possible. The features of the theme include WooCommerce compatibility, powerful admin panel and of course WPBakery page builder support – and this is what creates its main functionality. Bootstrap components make the theme easy to work with, and Live Customizer gives it a lot of magnificent options to edit its pages as well as change its look and feel. Multiple homepages, WPML support, clear documentation, and many more advantages are available. 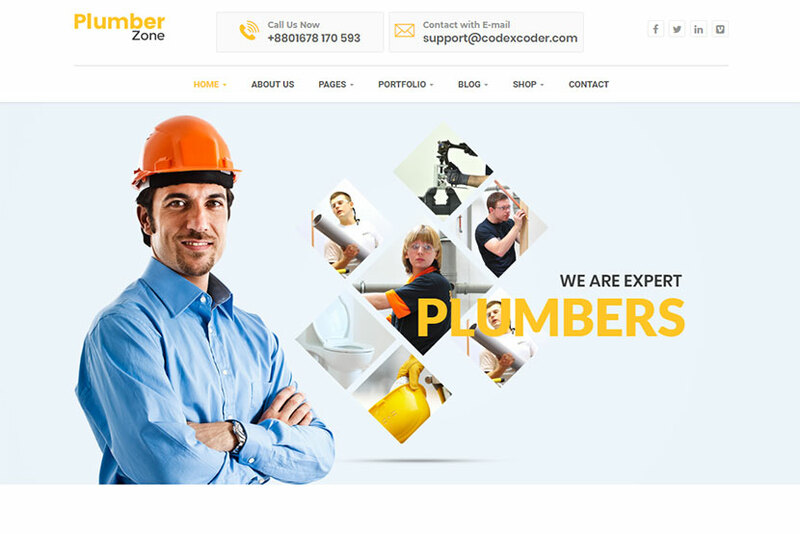 A modern and elegant WordPress theme craftily made for handy businesses like plumbing, construction, renovation and other types of home services. The template comes with powerful admin panel and plenty of customizable elements accessible from the admin panel. As the theme is compatible with WPBakery page builder, it also comes with a number of customizable shortcodes that give you complete control over your website. Revolution Slider premium plugin also comes with the theme to allow for creating awesome presentations on any web page. 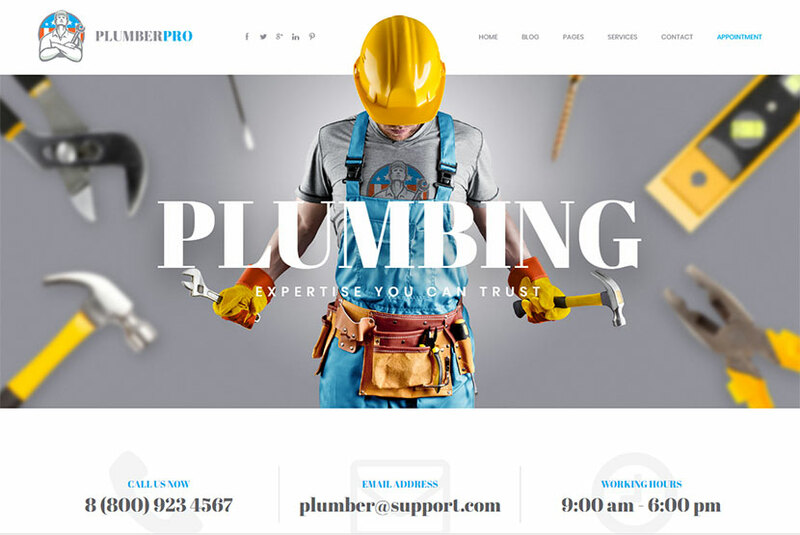 A plumbing, repair and construction WordPress theme which comes with a lot of outstanding features including a mighty admin panel, simple-to-use shortcodes, and a lot of advantages. 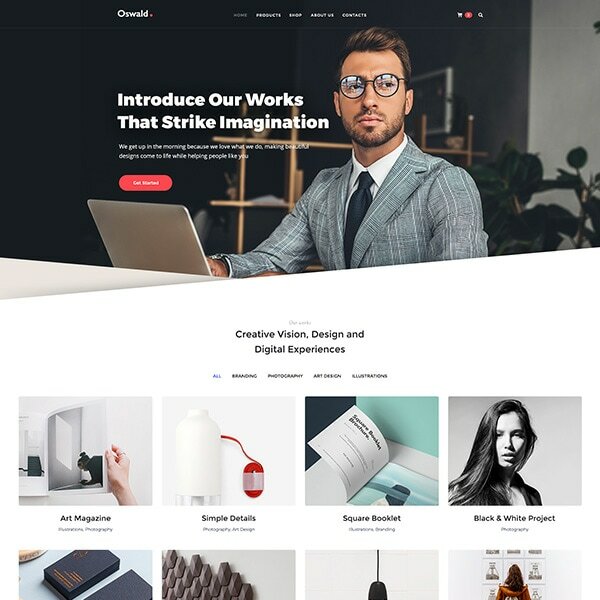 The theme boasts great typographic options, smooth WooCommerce integration, creative portfolio showcase, unlimited color schemes, different layout options for header and pages. It comes compatible with Master Slider, Contact Form 7, MailPoet Newsletters for WP and testimonial functionality. Much more features are also available. 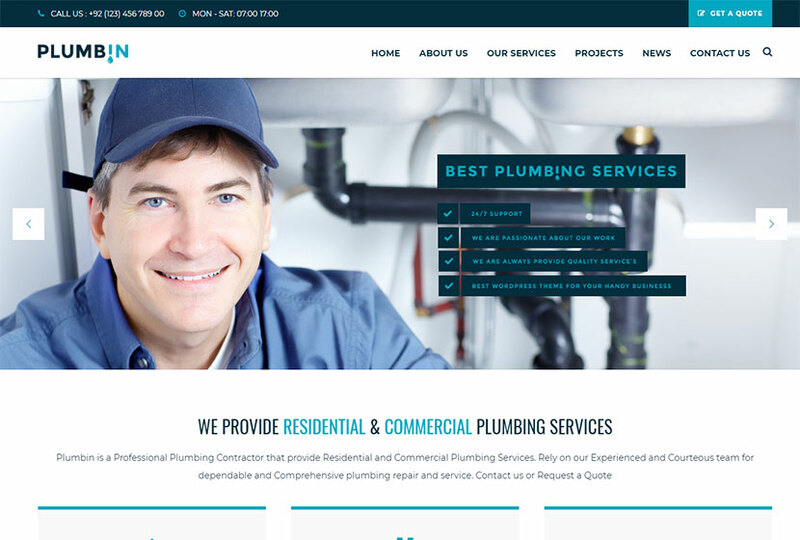 Another powerful WordPress theme designed for plumbers companies and home repair services. It provides many features to create your own company website easily and with no code at all. 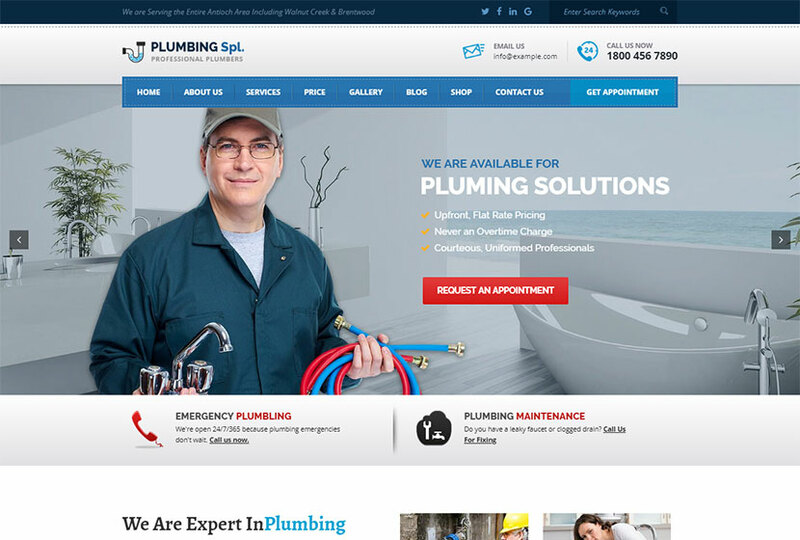 A business WordPress theme designed for plumbing companies and firms as well as fully suitable for any home repair and maintenance business websites including plumbing, carpentry, remodeling & renovation. 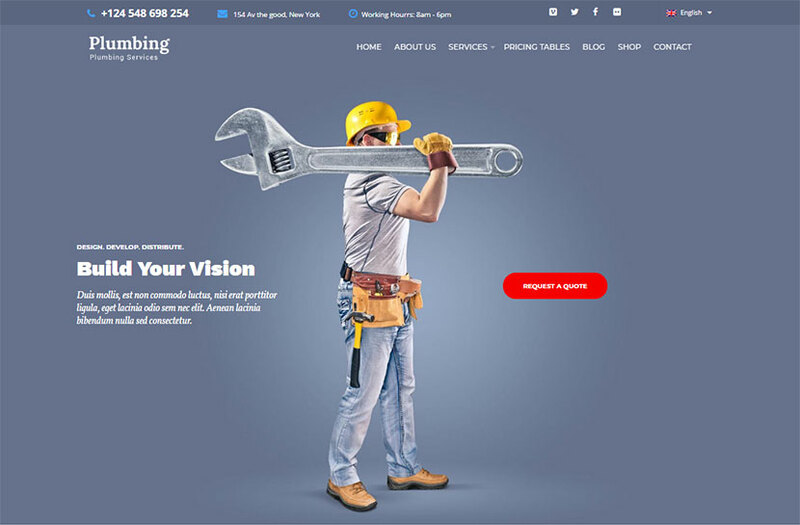 The theme is quite suitable for being used as a plumber and handyman portfolio or a comprehensive online store for selling building tools and equipment (as it is WooCommerce compatible). The template also includes all necessary page layouts for building a full-fledged website to promote your services. You can upload your content on pages like services, certificates, contacts, and many more. 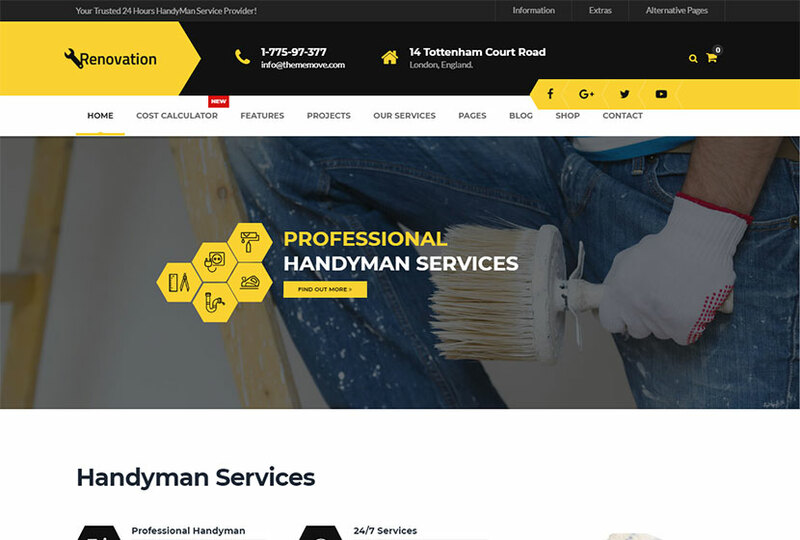 A trendy WordPress theme suited for professionals providing plumber, handyman, renovation or repair services. The theme comes with a number of pre-made page layouts including Services, Gallery, Team, Pricing, and more of them. You can upload your custom content at those pages to promote your business. The theme is compatible with Unyson page builder and comes with compact admin panel that has lots of theme options. 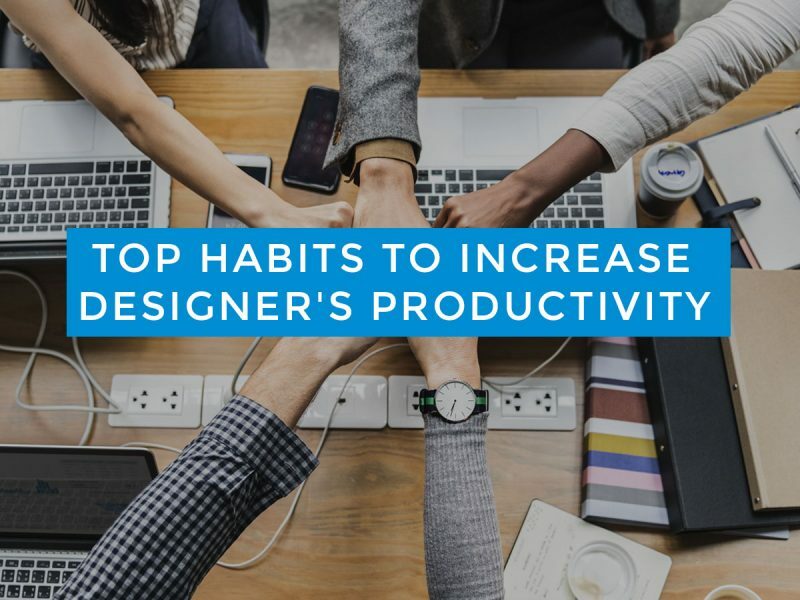 By the way, it includes a number of shortcodes, widgets, accurate typography, Mailchimp support, Booked and Team plugins compatibility, predefined color schemes, boxed and fullwidth layouts, and many more features. 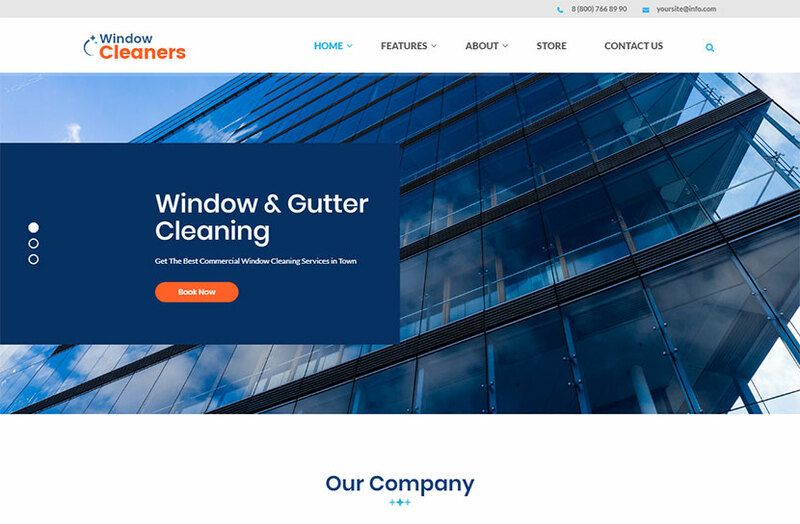 A micro niche WordPress theme appropriate for air conditioning firms, heating services, window cleaning firms and air/cleaning supply stores. It can be also suitable for a plumbing or carpentry firm website. The template can be quite called a multipurpose and multi-functional solution available with plenty of features. It is compatible with Booked Appointments plugin, Essential Grid, Slider Revolution and Swiper Slider, and more plugins. Features as interactive ajax search, flexible colors and typography, boxed and fullwidth page layouts, WPBakery page builder support, advanced blog settings, and many more ones are also included. A WordPress theme which is made to become a place to find someone to do the house work for you. It is suitable for websites providing carpenter, handyman, plumbing, heating, repair, and other related services. The theme comes compatible with WooCommerce shop functionality, so it can be transformed into an online store with simplicity. Other features of the template include a convenient form builder, mega menu, premium sliders, WPML support, one-page website support, and many more ones. You can feel free to choose this theme for door repair, electrical, painting, drywall, and other related services. 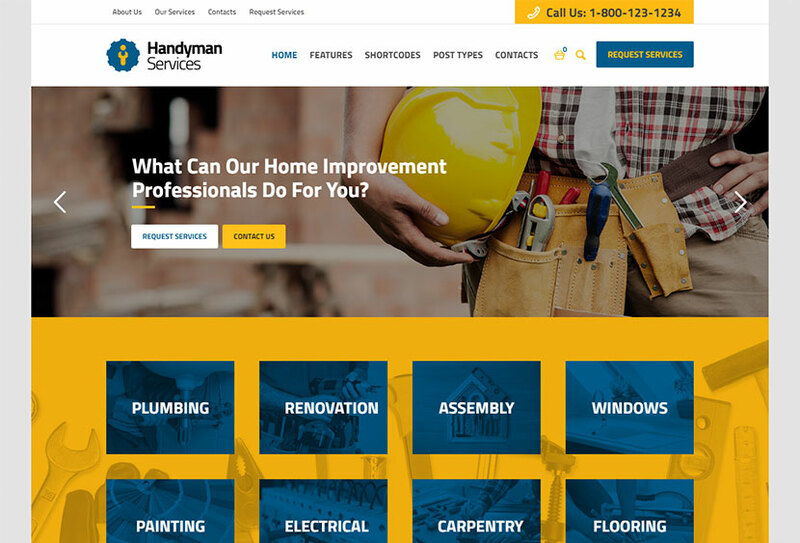 A nicely looking WordPress theme made with handyman services in mind. It is ideal for professional teams and experts to introduce their electrical, plumbing, painting, door repair, roofing, drywall or interior maintenance services. 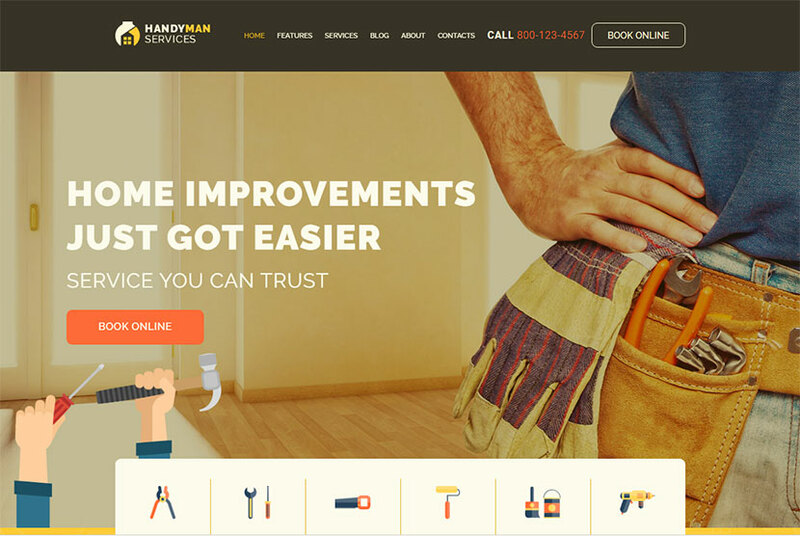 The theme is fully compatible with WooCommerce, so it is quite suitable for creating an online store and selling any equipment or tools for handyman business. By the way, it comes compatible with lots of premium plugins like Essential Grid, Contact Form 7, Mailchimp, Templatera, and more. Check out the features of the theme and decide whether it fits your needs. 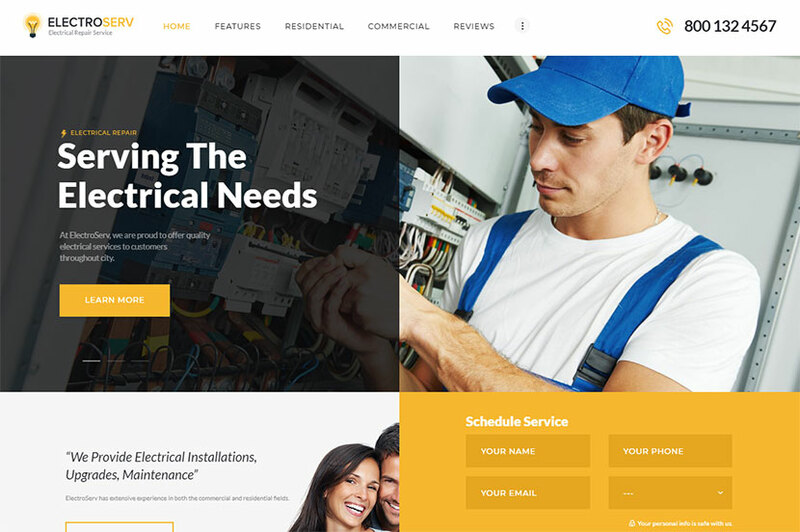 A new WordPress theme suitable for electrical services as well as maintenance and repair businesses. It can be ideal solution for companies providing renovation, plumbing, electrical, carpentry, decorating or roofing services, handyman teams, construction experts, cleaning agencies, etc. The theme comes with lots of custom shortcodes and widgets, it is compatible with Revolution and Swiper Sliders, boasts flexible colors and typography, a lot of advanced blog settings, cool layout options, WPBakery page builder support with the possibility to customize header and footer layouts, powerful theme framework, and many more features. 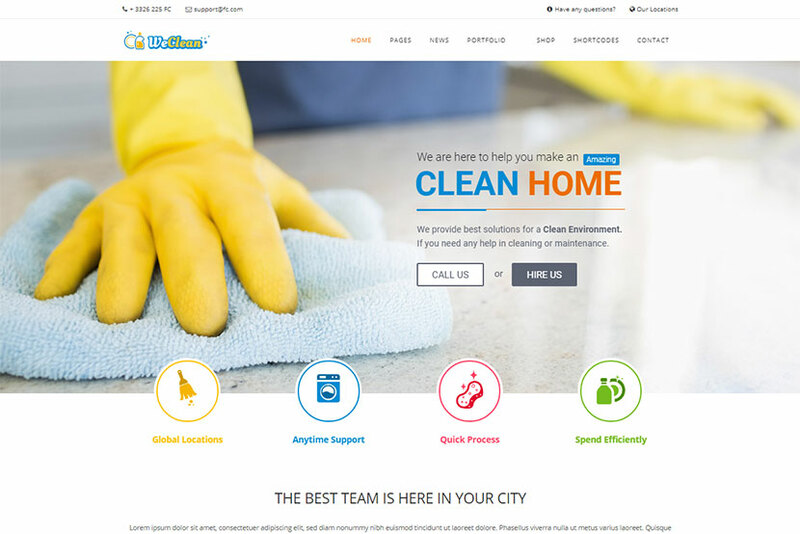 An elegant WP theme especially made for cleaning services providers or other related companies offering plumbing, maintenance, plumbing, hardware, and other services. The template boasts 5 dual color skins and 20 single color skins, 5 different icon box types, lots of shortcodes, newsletter subscription, blog section with isotope and grid layouts, portfolio with default pagination and ajax load more option, WooCommerce support, fully customizable mega menu, a new improved page builder integrated, and many more brilliant features that are available. A professionally designed WordPress theme including the 6 concepts for services like gardening, plumbing, cleaning, pool services, handyman, moving and storage. You can also select this theme to build a website for construction, electrical, painting, carpenter, and other related businesses. The template comes compatible with a number of powerful plugins like WPBakery page builder, Slider Revolution, Ultimate Addons for WPBakery, WooCommerce, WPML, and more. Features like Ajax booking, RTL and mega menu support, powerful admin panel, multipage and one-page support, and much more advantages are included with the package. 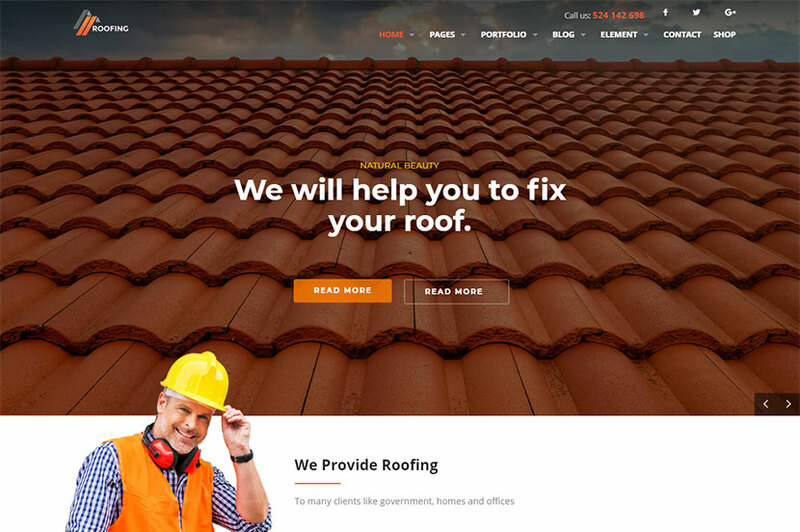 A niche specific WordPress theme designed for construction companies or roofing and repair specialists. You can also choose this theme for paving, renovation, handyman, painting, engineering, and other related service providers. The template is fully compatible with WooCoomerce, created by RTL native speaker, comes with WPML support, compatible with WPBakery page builder, includes Contact Form 7 functionality, based on Zurb Foundation 5, comes with unlimited colors and easy font selection, and has many more important features. A splendid WordPress theme crafted towards building services including the ones like painting or plastering. 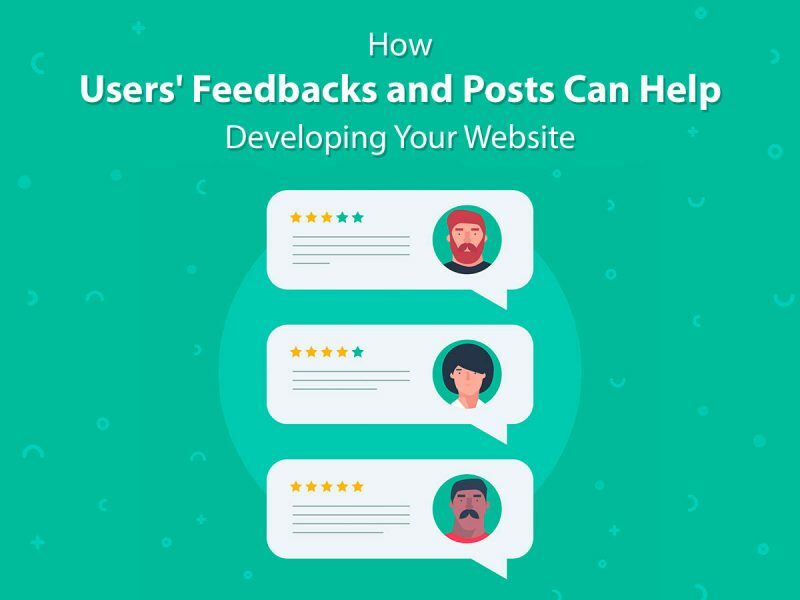 The topic related businesses like architecture, construction, plumbing, carpentry, remodeling, and others, can also select this template for building their online presence. A full pack of shortcodes and custom widgets contribute a lot to quick and easy content and layout management. The theme includes the Quote Request functionality which helps to easily get in touch with you and allows customers order your services without an effort. As the theme is integrated with WPBakery page builder, one can create awesome unique pages and upload content without using a single line of code. 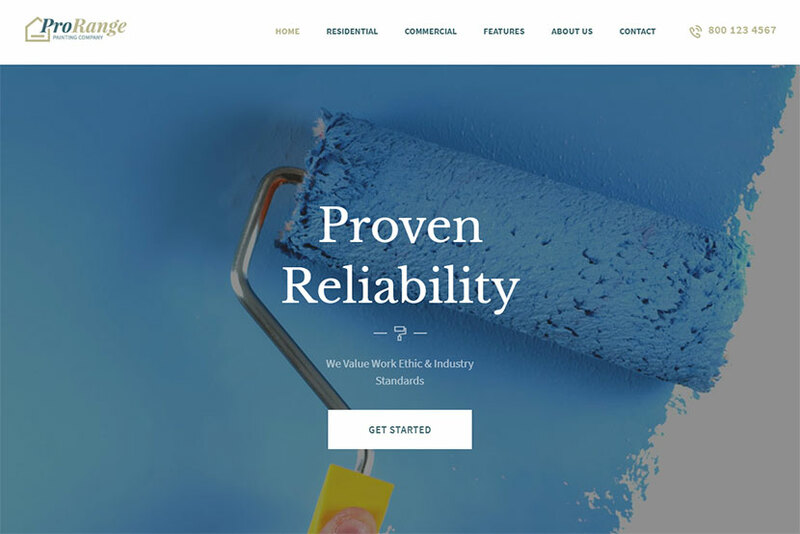 A modern and functional WordPress theme dedicated to any types of maintenance and repair businesses. If you provide any renovation, refurbishment, plumbing, electrical, carpentry, ceiling, windows & doors installation, decorating, painting, flooring or roofing services, this theme also has you covered. The features of the theme include the Revolution and Swiper sliders integration, translation options, WPBakery page builder and shortcodes, multiple homepage layouts, unique settings inheritance and override system, media content manager, WPML support, WooCommerce compatibility, PO Composer page builder, and many more advantages. 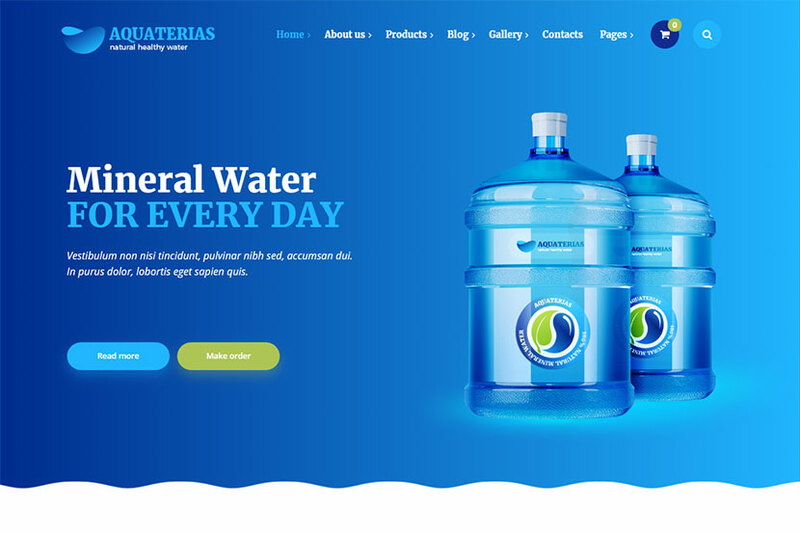 A modern and amazing WordPress theme especially created for clean water delivery company. It can be suitable for firms offering bottled water, water filters, home filters, mineral water, drinks, water mining, and others. Pool building and cleaning services are also possible to promote with the help of this theme. The template includes a number of awesome features like amazing parallax effects, WPBakery page builder with 20+ custom elements, multilevel menu, Contact Form 7 and Mailchimp support, fontawesome integration, Bootstrap 3 grid, easy color customization, unique shortcodes collection, great scroll animations, easy color customization, and many more features. Stay tuned for more amazing theme collections we are going to prepare for you very soon!